One of the worst remakes in recent memory is Samuel Bayer's reboot of Wes Craven's A Nightmare on Elm Street starring Jackie Earle Haley (Watchmen) as new Freddy Krueger. The 2010 remake boasted a screenplay written by Wesley Strick (Arachnophobia, Cape Fear, Batman Returns, Wolf, Doom) and Eric Heisserer, who would later go on to pen such classics as Denis Villeneuve's Arrival starring Amy Adams and Jeremy Renner. But now that almost a full ten years have passed, what does Heisserer remember about his time on the infamous remake? 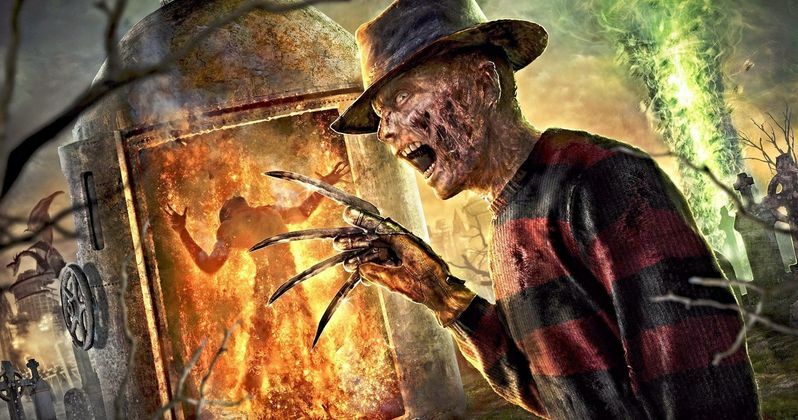 Well, Eric Heisserer took to Twitter to talk about his own personal nightmare making the movie including a moment where he confirms a draft where Freddy Krueger was innocent of the crimes he was burned alive for. Heisserer says this. "There was an iteration of the movie at one point where he remained innocent and vengeful, but then it flipped back." "...With so many scenes that pay homage to Wes Craven and a story that stayed close to the original, you'd think it would be considered a remake by everyone involved. But nope. For credit purposes, another writer got it classified as a sequel. Which infuriates me even now. Why? Because it meant Wes Craven was not given story credit. For characters and a world he invented. For a plot twist akin to PSYCHO that was his idea -- you don't realize Nancy is the heroine for the first act. I petitioned to have him included and lost." Again, highway robbery, I say. But anyway, then Heisserer goes on to talk about his experiences on the movie in a more specific tale, writing this. "Oh man. What a lesson for me in first movies made. ... I wish the script I'd written, with the two NL execs as shepherds, would have been the movie. ...the draft that we thought was going to be shot was different in many ways, some big and some subtle. This happens a lot, but I still have memories of arriving to set and recognizing nothing from the script on the shooting schedule. On my first day on set, a crew member told me, "In this intro scene for the two leads, we decided there wasn't enough dialogue for them at this party so we took some dialogue from page 87 and put it here." In case you were wondering, this is NOT how it works. And that was one of so many things I saw undone." "One of the New Line guys and I worked hard to sidestep tropes in the script. An example: Freddy appearing while two characters are driving in a car. The trope we've seen a thousand times is: Freddy is standing in the middle of the road, and they have to swerve. Let's be smarter. And we were. He can appear anywhere, and we have the advantage that you don't know which of the two is dreaming -- driver or passenger. So we had Freddy rise up in the back seat, taunt Quentin (driving) as he gores Nancy through the chair, blood spraying the windshield, Nancy screaming at Quentin WAKE UP and he snaps to realize he'd drifted off while driving and the two crash the car into a tree. Now they both have concussions, to complicate matters when they realize the way to kill him is to fall asleep and then wake up once they have hold of Freddy. What do I see on set that night? Freddy standing in the middle of the road." "There are a thousand reasons why things like this happen, but with the right team in place, you have collaborators who plus up the project versus make it a different thing than what it was originally designed to be. All of this a really long-winded way of saying: Yes, this should be remade. I'm not advocating my script from back then, but just have it made by people who have a love and expertise of not just NOES but horror. There are some amazing voices today for it." Heisserer goes on to say that his draft wasn't used for the final film because the director Samuel Bayer "had other ideas." Too bad. But Heisserer has gotten the last laugh so far considering Bayer has yet to make another movie, while Heisserer has made one hell of a career penning some classic genre efforts such as Final Destination 5, The Thing remake, Lights Out, and Netflix's recent hit adaptation of Josh Malerman's novel Bird Box starring Sandra Bullock. Not bad at all. Up next, Heisserer is working with Jeff Wadlow on the script for Vin Diesel's Bloodshot. This story comes to us from Eric Heisserer's Twitter.